More and more girls are inclined to the choice of natural means in the care of themselves. A great popularity is gaining the use of various essential oils in cosmetic procedures. One of the most popular is grape seed oil. In any pharmacy you can buy for 40-70 rubles a vial with a truly healing remedy. What does it represent? 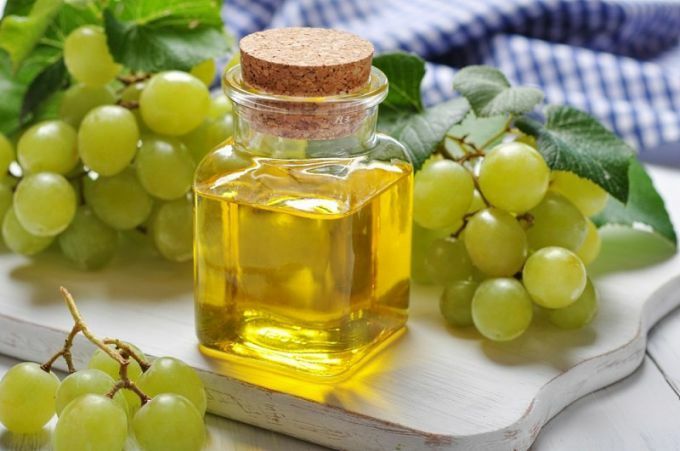 Grape seed oil – 100% natural product, which can be obtained from the grape bones by cold pressing or by hot extraction. No smell, very light and gentle. This oil is used in caring procedures for skin of the face and body, nails, hair. It is truly universal. It is added to all kinds of creams and is used as a mono-product. If the skin of the face became gray and there were swelling, then you can use a massage with grape oil. A few drops warmed up in your hands and massage your face on massage lines for no more than five minutes. Leave the oil on the skin for another ten minutes, after which the face gets soaked with a paper towel. If you do such a massage every day for two weeks, the face acquires an even, beautiful color, the pores become narrower, and the fine wrinkles are smoothed out. In addition to massage, you can make masks. Total 10 procedures for 15 minutes. It will take 2 wafer towels. We moisten them in hot water, apply a warm oil from the grape seed to the cleansed skin and cover with one towel. When cooling, we change it to the second, warm. After the fifth procedure, all rednesses are eliminated, and the skin becomes smooth and flowering. If Your problem is cellulite, then the magic oil will also help you. Within a month, every 3 days, take a bath with the addition of a tablespoon of grape seed oil mixed with honey, salt or cream. Skin in problem areas will become elastic and tightened. Do you have dry, split hair, or do you often experiment with them, changing the color and structure? They need help. Daily for a month rub into the scalp warmed in the palms of oil grape seed. Carefully comb hair with a rare comb (preferably wooden), cover with a film and a handkerchief. You can wash it off after two hours or even leave it overnight. Wash hair with shampoo, then rinse thoroughly, also rinse with warm water with lemon juice (for blondes) or nettle broth (for brownies and brunettes) at the end. The grape seed oil of course You can lubricate the lips and skin around the nails, and also add to salads and use when cooking various hot dishes – neither taste nor useful qualities are lost.